Semana Santa, otherwise known as ‘The Holy Week’, starts a week before Easter. It is one of the most important holidays in Spain. The people of Spain like to keep up with their traditions and this is one of them. During Semana Santa, there are many parades, processions and festivities. People play music and enjoy good food, and a lót of it..! This is a very special time of year when you want to see another side of Spain and its local traditions. If you have are already booked your trip, enjoy this special time! 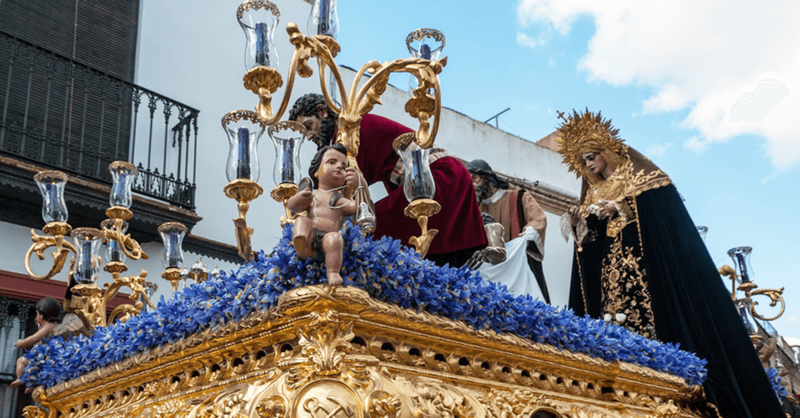 Semana Santa is one of the most important public holidays in Spain and a very popular period of the year both for Spanish residents and tourists. It is wise to plan your trip well in advance as pricing for flights and accommodations will be elevated. Also, keep in mind that during these bank holidays most of the supermarkets and shops are closed and public transport may have fewer services. The restaurants and museums stay open, but reserve a table if you want to be sure of a spot. Each city has its own special Semana Santa programme with activities. So check where things are happening and be on time! Our message to you: plan ahead but above all, enjoy this holiday full of Spanish tradition and take lots of pictures! The festivities start on ‘Palm Sunday’ or ‘Domingo de Ramos’. That is the day that Christians celebrated the arrival of Jesus in Jerusalem by waving palm leaves. The next important day is Easter Thursday or Jueves Santo and this is a public holiday in Spain except for Cantabria, Cataluyna and Valencia. The following day is Good Friday or Viernes Santo which is a public holiday throughout Spain and the main day for the processions. In the weekend you have Easter Sunday followed by Easter Monday which is also a public holiday. There are some differences among the Spanish cities in what way Semana Santa gets celebrated. Find out the differences below! Who celebrates what and where? The region of Andalucia is famous for its marvelous celebration of Semana Santa. They celebrate it like nobody else. People from all over the world come here to enjoy the festivities. So, what is so special about this celebration in the southern part of Spain? The cities of Seville and Malaga really go all out with Semana Santa. Some say that this is the best place to be for the festivities, others claim that the region of Castilla-Leon is the best. Over there, they start a bit earlier with the festivities and have more events. We will let you be the judge. Each procession consists of the same elements: men of Christian brotherhoods dressed up and carrying big floats through the streets with a large following. In Andalusian cities however, the floats are bigger and heavier than anywhere else. You will also find some balcony performances of flamenco songs along the way and the entire procession stops and listens until the song is over. The Basque Country is also filled with religious processions, marches and Easter treats. Some you can see in Bilbao, but the best parades and religious reenactments can be witnessed in the small town of Balmaseda. The main attractions in Catalunya take place in Barcelona. The city does not have many Easter processions but there are some. There is a procession on Palm Sunday in the Raval area but most Barcelona Easter parades are on Good Friday. At 20.00h in the evening, three Easter processions meet in front of the Barcelona Cathedral. In the Eixample neighborhood, you have a Palm Sunday market and in many bakeries you can buy the famous Easter ‘mono’ cakes.